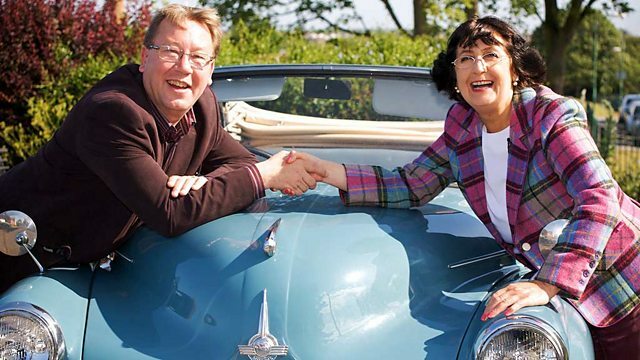 Antiques experts Philip Serrell and Charles Hanson begin the fourth day of their road trip in Cambridge, before passing through Peterborough and heading towards Suffolk. This is the Antique Road Trip! This week we're on the road with the dashing duo. PHILIP SERRELL: Charlie, it's a lovely day and I'm in the lead. Well, it just feels like the natural order's been resumed really, Charlie. I've got it in me to come back. lost his lead at the last auction. So now he's falling over himself to claw it back. I'm the older one who buys this sort of stuff, stupid things. ..who's trying hard not to let success cloud his judgment. ..are starting to light Phil's very short fuse. -Do you sleep in pyjamas? -Oh, for God's sake, Charlie! How many more days have we got of this? Well, Phil, you're over halfway through the trip. Charles has turned a starting budget of £200 into £284.54. Phil, though, has pulled ahead, turning £200 into £327.56. and they're covering some distance. before ambling towards auction in Glemsford, Suffolk. Cambridge is celebrated for its 780-year-old university. Phil, don't you feel like Harry Potter? -Of that magical presence of academia. Don't you feel high intellectual when you walk right down here? Actually, I've never felt high intellectual in my life. Enough of your nonsense, Hanson. It's time to get serious. This morning you've got two shops side by side to get you started. -Which one do you want, Charlie? That one or that one? Hanson's on a mission here. He's off. -Phil, I'm quite happy to go in this one first of all. You know, I'm playing catch-up now. You just got left behind, Phil. Charles has buzzed off into the hive. ..it's quite oaky and, also, it's not far from Holland. There are about 200 miles and the North Sea separating them, Charles. He's on another planet sometimes, that boy. Shake, rattle and roll, Phil. I'm coming to get you, OK? Lordy. Bang any harder and Phil will hear you next door. -So how are you? All right? -I'm well, thank you. What about you? and let me have a look around. -Oh, this is what we like. Might find something of interest. Haven't unloaded them today yet. Ah, new box filled with old treasures. Bits and bobs, bits and bobs. Will something in here tempt Phil to part with his £327? That's got Charlie's name written all over it. It's masons. I can't even read the mark on the back. Can you see it? That's got to be £35, best. and it's called Sunderland Lustre cos it was made up there. And the lustre is this sort of pink, almost like luminescent, colour here. He's after this masonic plaque. Owner Stephen wants £35 for it. -I think that I might have a go at that for you. -But I was going to offer you 15 quid. -I think it probably is old, isn't it? -Although it might be new. No, I'll give you 20 quid for it. And I think, genuinely, I think it's got a chance of being an old one. and now the world's his oyster. How old do you think this globe is, Stephen? I think it's got the old Russian states on it, hasn't it? -It's the USSR, isn't it? It also boasts a double axis with a ticket price of £39. -I can go a bit lower, Phil. -Could you do 20 quid for me? Uh... Yeah, of course I can. -Can I ask you to do me a favour? Can you keep it by for me? -Until about four o'clock this afternoon? Phil's almost bought two items, but Charles is still empty handed. I'm going next door now. Phil, you're still here. Isn't it changeover time now? -It's a good shop, Charlie. -I know it is, I know it is. -You mean you're throwing me out? Phil, the going is getting tough, OK? -See you, Phil. Good luck. You've got the shop to yourself and over £280 to spend. which just give me a heartbeat. don't buy knobbly knick-knacks - buy to impress, buy real antiques, Phil. Actually, Charles, Phil's not doing too badly. That's quite nice, the little compass. That's silver, isn't it? -Oh, it is. It's got a hallmark. help Charles get back on track? What would the Suffolk line compass have to be? -You were the bigger roar. Oh, I'm sorry, you're Welsh. I'm sorry. He sure knows how to turn on the charm, eh? -You've got to buy it for a tenner. -That came in with the same lot this morning. to almost give a life to the compass about where it's travelled. If I bought the two together, what's your best price? £20. Best price. No arguments. You've got a bargain. You know you've got a bargain. Show me the money. -Meet me halfway at £15. My final offer - and this is so I do get a profit - is £16. For 1,600 pence, I'll say 'sold'. Do you do change? -Uh... We can change it into a fiver for you. Stephen's a very generous chap. -But you said £16 to me. how can I possibly not? Those boyish good looks land him another £1 discount. is the actual fob watch chain. -You want to put them together? -Yeah, it is solid silver. which means I would owe you an extra £15 now. -You're good at sums, aren't you? Indeed, there's no end to his talents. That's quite a haul for £30. I wonder if Philip's having as much success next door. How much is the death plaque? -It's known as a death penny, isn't it? Given to the family of each soldier that passed in World War I.
because it looks similar to the coin. They were issued to the families of fallen British soldiers. This one has a price tag of £85 on it. Not much for a life. -See, I think...I think it IS going to make £40 to £60. -I've got to try and buy it off you for £30. That's the bottom line for me. If you can go £35, I'll have it. -All right. You're a gentleman. -Thank you very, very much, indeed. Another item and a generous discount of £50. Ooh! This shopping lark does look exhausting. -Sorry. It's the heat. It's lovely. Sorry. -We're in England in September, Charlie. -Go in the car. What have you bought? Easy, Phil, that's Charles's little secret. Now play nice in the car, boys. ..would you think I was a Cambridge student? No. Cos most of them have got hair. A bit harsh, Phil. But fear not, Charles. there's another Cambridge tradition you'd be perfect for. -Charles, very good to meet you. -My father is a Philip. And he always told me how enjoyable it was to go punting. And I can't believe I'm following in his footsteps. It's wonderful. Dreams CAN come true, Charles. punting's been around for centuries. punting from the practical to the pleasure pastime we know today. this art and passion for punting in Cambridge. -Almost went then. Was it something that just took off? so he sort of made it an image which is always associated with Cambridge. Cambridge, although it's definitely more dangerous. -We should probably duck here. Adjust very quickly. You get used to this with all the bridges. -I feel like Indiana Jones. It's good, isn't it? Indiana Jones? More Frank Spencer, I'd say. Oh, I think late 19th century. ..you and water were made to go together. Yeah, Phil, I think the landscape now suggests I ought to have a go. -Yeah, I think so. I'm a fairly strong guy. -Let's go for it then. -Sure thing. So here's the pole. I don't think I'd like to be on board much. -So, Phil, all I do, I hold it like that. -In the ground it goes. Drop it through your hands, let it slide through your hands. drag the pole towards the right bank. There you go - perfect. To the left a bit. Would you travel with Charles Hanson in a punt? and hold on to it, I'm a pole-vaulter. I think you've got the basic principles. Look out! Oh, my God! You've hit somebody, Charles! Oh, no, he's hit the bank. -Over to you. Thank you. It's been immense. And do you know what? because this, Phil, is the life. Ah, the sun has just come out. It's a miracle you're still dry, Charles. Time for a little lie-down, old fruit. I think you've earned it. How's rival Phil getting on? He's off taking his next punt on a purchase. -Warren, I'm Philip. How are you? -You've got a bit of everything in here. doesn't sell that too much, really. It's sure as hell not Drew Barrymore, is it? Right, let's go have a look at something. What about checking out some antiques, eh? I do like that one. What's that? It looks like half a drainpipe. Came from a local garage. It took four of us to lift it in here. I can sort of feel myself warming to the task, yeah. Mmm - a large yard of antiques and Phil's attracted to this great lump. but may have had some kind of commercial or industrial use. Warren wants £250 for it. So it's probably 1960s, isn't it? It's made of reconstituted concrete but it looks a bit like granite. I think it will make a fun garden feature. What do I think that's going to make at auction? I think that's likely to make 120-180 quid, that's what I think. -What's the best you could do it for? let's just see if this makes it feel better. -Got some mind tricks on the go here, Philip? There's 100 and there's 20 quid and I've got my train fare home. I'm gonna give you that cos I just think it's a fun, fun thing. and some plants, as far as I can tell. -I think I did know that. Well, sir, does it look any better on a second viewing? -I think I'm gonna have that off you. It's 20, wasn't it? -Just like that, he's four items up and £205 down. he rejoins Charles in the Triumph to relax for the night. If Charles ever calms down, that is. It's a beautiful morning, perfect to enjoy with some good company. -Charlie wants to play a game. -..with my little eye, something beginning with G.
-What sort of idiot are you? -You can't say, "Oh, there's a green." -"Oh, look. That's not the sky up there, it's a blue!" -You do. You worry me. Come on, Phil. Who doesn't like a classic game of I-spy? did they have the old shire horses working the fields? When I was young, they did not have shire horses. But Worcestershire is a very traditional county. -Phil's fuse seems even shorter today. It's 9.15 and you've worn me out already. leaving him with £122.56 to spend today. and the photo frame with the image of a First World War soldier. -He has £254.54 to play with today. -Do you ever stop to draw breath? -I want to dream, Phil. I had a dream that in this car you and I found the big one. Will Charles's dreams come true? this pretty market town boasts many ancient buildings. So it's perhaps the perfect place to find your treasure, Charles. -Today, Phil, I feel really fertile. -I'm glad I'm getting out of the car. -The sap is rising, Phil. I'm going to have a wander around Oundle cos I think it's lovely here. -So as Phil soaks in the sights, Charles hits Harpers. -Good morning, Charles. How are you? A family business of antiques and jewellery run by jeweller Nigel. I'm on a mission today. I'm behind in the Antique Road Trip stakes. Philip's taken the lead and he's pretty confident today. He's having a wander around town. He said, "Hanson, you take the first shop. "I'm quite content just wading around this great market town." be a wow factor for Phil to say, "Good man, Charles. -"You've done quite well today." -Let's hope we can find you something. -Well, coming down in price is a good sign. -I think this fan dates to about 1810.
it may be even earlier than that. Priced at £50. -It's an interesting lot, isn't it? -Have you got any more out the back, then? -Can I have a look at some? -I'll come look at them with you. Thanks. but not for the first time, Phil's taken an unconventional turn. Are you after flowers or is it just the old crates? -Hi there. How are you? I'm Phil. -That's a good omen, isn't it? Well, it's not an unusual name, boys. but what does our Phil want from the other Phil? I saw those there, those fruit boxes. They're quite trendy, aren't they? -And these are yours as well? -Would you be interested in selling these? So these date back from the 1950s and 1960s. Well, I suppose they do have some age to them. If I gave you £20, would that be a deal, do you reckon? -25 and we've got a deal. -Go on. Thank you very much. Seven vintage fruit crates for £25. and he's very interested in Nigel's box of fans. The collection for the boxful, I want £250 for. Well, Charles, you HAVE still got £254. possibly dating to the Victorian period or earlier. Some are made from mother-of-pearl. There's even a Chinese carved ivory fan. Not everyone's choice of material but potentially valuable. They're decorative. It's just what knocks them is their condition. -Oh, dear. What a shame. What's your best price on those fans? -You won't take £100? What's your best price, Nigel? Last price? -I know you're gonna do the deal with me. -Including the fan you found over there. If you don't buy them for that, what can I say? -Do you know, Nigel, I said 100. Would you meet me at 125? I'll take them. Thanks, Nigel. Good man. -Charles may well have struck gold with this find. I'm really excited because it's a private collection. They could make 50 at the wrong sale. They could make 400 at the right sale. That's exciting. but right now I don't think he's got a care in the world. the largest city in Cambridgeshire. It's actually really quite nice. with archivist Paul Smith as his guide. taking around 65 million holidays. But this is a modern luxury. let alone to another country, unless you belonged to the upper classes. -and his name is still synonymous with travel. -That's the man himself. That is Thomas Cook. -So when was he born? -How did he come to travel? -He wasn't a great traveller himself. and that was what really changed his life. That was in the 1830s. their time and money, other than drink, then society would improve. This selfless social enterprise soon became a commercial one. offering customers a package deal at a knocked down price. the precursor to the modern holiday brochure. -and this was a handbook of his trip to Liverpool. -That was Thomas Cook's first commercial venture. -because was anyone else doing this in the 1840s and '50s? This actually involved three different railway companies. and negotiate a fare for that whole trip. and upper classes with trips firstly to Europe then further afield. revolutionising the way we explore the globe. When did it cease to be a family business? The family business stops in 1928. What you've got is Thomas, then John. John has three sons. -and the two surviving sons actually sell the business in 1928. Really mercenary question here. How much did they sell it for? They sold it for just over £3.5 million in 1928. -The best part of 120 million. Right. On that note, come let me plan a holiday. end your time basking in the top spot. he can really maximise his profits. What I've done is I've split the collection into four lots. they'll be collectors of different periods, different styles. Let's go oriental flavour firstly. This is Chinese/Cantonese, 1880s. and of course we know that legislation, it's pre-'47. We can sell it. I'm really excited about that one. This is my regency collection here. Late 18th century, early 19th. 1890. They're pretty big and not overly valuable. and these two lovebirds, I could be back in business. With Charles's stroke of genius fan the flames of Phil's demise? Brace yourselves, boys, for the big reveal. Well, I seem to be quite nervous now. this is the first reveal where actually I've fallen behind. to come, and I hope you like my wares. -You going to show me your wares? -Get it? Fan-tastic in my opinion. -I'm just wafting. Sorry. OK.
-Put your hands in your pockets. -Right. Now leave 'em there. and Paris in the 1740s. -And also, Phil, my best fan is that one there. That's my best fan. I love it, Phil - because the craftsmanship. And I think, Phil, at the moment, these are quite hot. Are you nervous? -Do you feel that... Why are you nervous? I'll tell you why I'm nervous, because I think that's a good thing. -Why are you looking like that? -I'm waiting for your answer, Phil. -That could be £200 to £300. -The whole lot cost me £225. -That's really, really good. Shall I show you mine now? -What are they? They're crates, aren't they? -So what would you use them for? -Yeah. The clue was when I said fruit and veg. They're not my sort of thing. You know...they're dry, aren't they? -So if someone didn't want them, they could...burn them. -This, Charlie, is my favourite thing. I wasn't sure if it was a new one or an old one. But having got it outside...it's an old one. By Dixon and Co.
Tell me it cost you three figures. -That's a really, really good buy, Phil. -That's how much it was. and it's so big he couldn't even get it in the door. Is that a toilet seat there? -I didn't buy a toilet seat, Charlie. in a factory to...as almost like a degreaser, something like that. it's these are all fantastic, but that could be your Achilles heel. Charles is sounding more and more confident. I know Philip's really keen to win. He's determined to outgun me, and I think his plaque will. But his other objects, no way. I think Charlie's done really, really well. Those fans, they really are fan-tastic. really well for him. That's the winner. is that really big, robust concrete planter. Don't quite understand the mentality of Phil buying that. I think that £130 buy could suddenly turn into a huge loss. I don't know what I was doing, really, but...£130? You know, I could lose 70 quid on that. This could be a really interesting little auction. If I was a gambling man, who's my money on? Me. and now you've got to get back in the car with Charles. -Would you just concentrate while I'm talking to you? -I think you've been quite clever. -Unwittingly, I think you've been quite clever. -Charlie, will you just concentrate while I'm talking to you?! -I'm trying to give you the benefit of my pearls, you're looking at the hedge. in the village of Glemsford. Phil - it's almost like a fixture of the auction house. -There we are, Charlie. Door-to-door service. -Serrell's Taxis at your pleasure. Phil, remember - never have regrets, Phil, just dream. Dream a thousand things, Phil. we find out what auctioneer James Mander thinks of their lots. which is one of the lots in the sale. which is important with fans. On the concrete, it was a bit of an effort for us to get it in. in the garden, or a nice feature, so I'm sure it'll sell for that reason. lots that cost him £230. who's also offering up five lots at a total cost of £155. -Try and sit there. Put your hands down. -What were you like at school? -I used to fidget a lot. It's like...the results will be spoken shortly by the auctioneer. Right. Will you just sit...sit still? Put your hands on your lap and just sit there just for a minute, all right? Try and behave. You'd never guess Phil used to be a teacher, would you? Right, first up are Phil's fruitcakes...I mean, crates. Ha. -Maybe they can lighten his mood. Collection of seven vintage wooden fruit crates. Showing outside...well, they were this morning. I hope they're still there. AND, uh...£40 is bid. I'll take £2 anywhere. That's £42. £45. £48. £50. £55. £60. £65. £70. £75. £80. £85. In the doorway, and selling at £85. Pretty good start, Phil, eh? -Especially for something you picked up in a grocery shop. Oh, my. He's actually happy. But will Charles's first lot wipe that smile off his face? There's interest here at £30. I'll take £2 anywhere. £32. Back of the room. My bid's out. £35. £38. £40. £42. £45. £48. £48. -It's the gentleman's bid. £50, a new place. -No, it's £55. Gentleman's bid. Next door. And selling at £55. It's a good start for Charles with that £25 profit. -His globe's about to go under the hammer. There it is, as described. And there's interest here. -We start straight in with bids at £20. -Not yet it isn't, no. -On commission, and selling for £20. -£28. £30. £30 is bid. Charlie, I'm going to punch you. Bit by bit, the money's mounting up here, Philip. It's a small profit, isn't it? It's, like, um...it's like a fiver. -It's like go round the world. Pay attention, chaps. The first few fans are up now. around the end of the 18th and early part of the 19th century. We have interest here at £20. And I'll take £2. £22. £25. £28. £30. £32. £35. £38. £40. £42. £45. -It's going on its own on the internet. £55. £60, I'm afraid. Still on the internet at £60. £65. £70. £75. Your bid at the back. £80 on the internet. £85. £90. £95. £100. -I think I'll pack my car, Charlie. Crikey, Charles - with just one lot, you've taken the lead. -It's really disappointing, as it's only 100-quid profit for you. Don't fret, Phil - your masonic plaque could turn things round. There's bids here. So we have to open the bidding at £60. I'll take £5. £60 is bid for the plaque. £65. £70. -It's going to roll, Phil. -£110. £120. We all done with the plaque? It's £120. A cool £100 profit puts them neck-and-neck. Phil's risky buy is up next. Is he going to regret spotting this large lump? -I'll take £2 anywhere. £40 is bid. £42. £45. £48. £50. It's my bid here. And selling on the sheets at £50. and it's given Charles the upper hand. -Have you ever heard the expression "bad loser"? come up. This time, it's the 19th-century collection. There's lots of interest here. I have to open the bidding...straight in at £60. And I'll take £5 anywhere. £60 is bid. £65. £70. £75. £80. £85. £90. You're off to the races, mate. -Depends on your perspective, Charlie. -And £10. £220. £230. £240. It's a commission bid now at £240. Charles is away! A massive £210 profit. Do stay, Phil. You've got one more lot left. as described in your catalogue there, at £20 to start, please. At £20... Nobody wants it. £20. Right in the back. £22. -£25. £28. £30. £32. £32 in the corner. -We all done at £32? -I'm absolutely flabbergasted by that - are you? It's got a lot of sentimental value, but no profit for Phil. Just two lots left, and they're both fans. and many are even boxed. F-A-N-S. What does it spell? Ah, it's like a recurring nightmare, Charles. I'm afraid we have to open the bidding straight in at £180. -Online bidders are out in force again. -Charlie, you've had a hell of a day. -£290. £300. And £20. £340. £360. £380. -Come on, let's keep going. -You've hit the jackpot here, Charles. On the internet. We're selling at £480 for the fans. His tactic of separating the fans has really paid off. This is a profit to be proud of. Start looking for other opportunities in television, I think. But last, not least, is the Chinese ivory fan. -We have to open the bidding at £100. And I'll take £110 anywhere. £100. £110. £120. £130. £140. £150. £160. -£170. £180. £190. £200. And £10. £250 now. On the internet and selling. We're at £250. £260. -Hello, China. Come on. One more for the road. LAUGHTER Thank you. It's been a great day. -He seems all right, strangely. -£300. Great. Put it there. On the telephone at £320. It's £340 if you want to bid on the internet. -I want him to bid. Done on the telephone, we're done in the room at £380. He wanted a comeback, and he got it! Yet another massive profit. -Thank you, Phil. Been a wonderful, wonderful day. This has been a wonderful road trip memory, Phil. If it's profit or loss, it doesn't matter. It's just a fun time, Phil. So you've made the thick end of £1,000 out of those. and made profits of £29.94 after auction costs were deducted. So, he's taking £357.50 on to the last leg. and so takes forward a whopping £1,191.44. All this success has done wonders for this blusterous relationship. So let me open the door for you, Charles. I can't believe it, Phil! I can't believe it. -I'm trying hard not to, Charlie. Phil, I'm lost for words. -Let me put the belt around you. Don't get it too tight round your neck, Charlie, will you? Don't even mention it. Not a word. But one more time I will say it's been a fantastic day, hasn't it? Yeah, I've really enjoyed it, Charlie. Phil, it's never over, though, until the fat lady sings. -I told you earlier. There's still one more auction to go. Funny things can happen... Or fonny things, if you're from Derbyshire. -Brace yourself, Phil. Here he goes again. Are there any treasure songs we can sing together? high roller Charles is living the high life. Any interesting bits that might cost me £400. I can afford it. -So the gloves are off for Phil. -Charge him more. He's got plenty. Philip Serrell and Charles Hanson begin the fourth day of their road trip in the county town of Cambridge, before passing through Peterborough and heading towards auction in Glemsford, Suffolk.